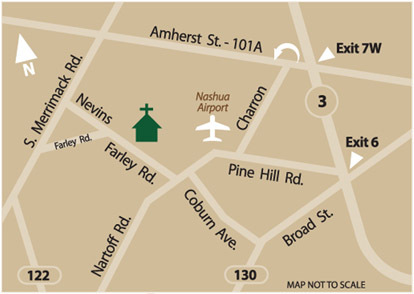 From Everett Turnpike north or south, take exit 7W onto Amherst Street(101A) toward Milford. Stay in right lane and take jar handle turn to the right just before the second traffic light. (Jar handle turn loops to the right then back to the left to traffic light). Cross Amherst Street at traffic light to Charron Avenue. At stop sign turn right onto Pine Hill Road. Proceed down Pine Hill Road 1.5 miles past Boire Air Field and Daniel Webster College. Farley Road is the 2nd right after the "Y" on Pine Hill Road. A directional sign for the church building is posted on a utility pole opposite where Farley Road intersects with Pine Hill Road. Turn right onto Farley Road. The church building is on the right about .9 mile, 1/2 block past Farley Farm sign.